Premier League leaders Chelsea will play Newcastle United in the 21st matchweek of the Barclays Premier League today. Blues boss Jose Mourinho has a fully fit squad to choose from. The Portuguese manager may start with the same line-up which were beaten by Tottenham Hotspurs on a New Year day. 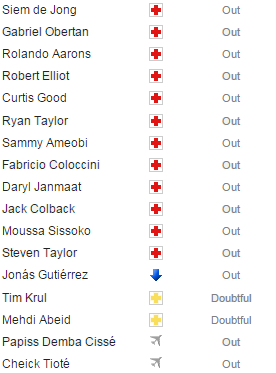 Newcastle is the only club in the Premier League with 15 injured players. Twelve of them are out while Jonás Gutiérrez is still not match fit after beating cancer and duo Tim Krul and Mehdi Abeid are doubtful for this clash. The main concerns for the Magpies are Fabricio Coloccini, Moussa Sissoko, Daryl Janmaat and Jack Colback as all the key players are out. While the two Africans Cheick Tiote and Papiss Demba Cisse are on international duty for the Africa Cup of Nations. The Blues have won their last nine Premier League home matches. The home side have kept six clean sheets in their last seven league matches. Eden Hazard has scored four goals in last six games. In the past six meetings between them, Newcastle have won two while other ended in favour of Chelsea. The Magpies have won only two of their last six Premier League games. Chelsea 3 – 1 Newcastle United.